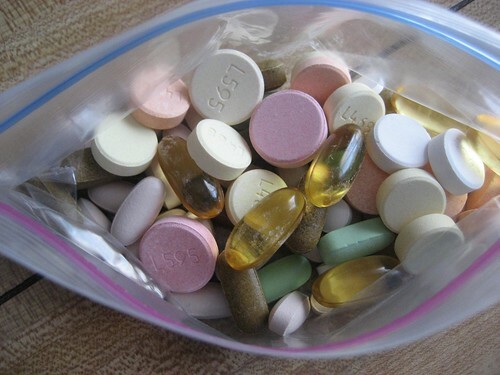 I took this photo a couple years ago of all the vitamins and supplements I was packing to go on a week long trip. It would look pretty similar if I took one this year; the colors and sizes and shapes of some of the pills have changed as I’ve swapped new brands in, but the mix is about the same. There’s a multivitamin (no iron) to cover a lot of the bases. Most days, that’s a drugstore brand one a day but other days it’s something fancier from the health food store that takes three or six tablets for each dose. There’s some glucosamine/chondroitin (currently three a day) for my joints. There’s fish oil for my heart (and other stuff). There’s calcium for my bones. There’s extra Vitamin D, also for my heart (and other stuff). Sometimes there’s extra Vitamin C for my immune system. I know some studies have shown no benefit to supplements. I know I feel better when I take them, and I can afford to buy them, so I keep doing it. It’s like casting a spell of protection on myself every morning. Maybe the magic won’t work, but won’t it be great if it does?